The media firestorm over Alec Baldwin’s ejection from an American Airlines flight for refusing to stop playing Words With Friends, has led to more downloads and a heighthened popularity of the game. The initial reaction after downloading the game is eagerness to play friends or people and test your skills. Once you’ve played a few games against different opponents, you should start to realize that there are lots of average players and several stellar players who completely dominate the game and win by huge margins. How do they get those high point totals? What’s their big secret? The answer lies in your Words With Friends gaming strategy. 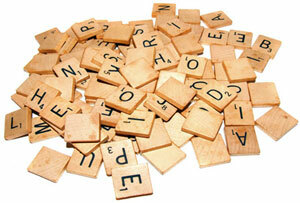 Most games are decided by who controls the Triple Word and Triple Letter scores. The skilled players employ a defensive strategy that is all about playing decent words, but in ways that prevent you from landing on the colored spots on the virtual game board. If you want to improve your point totals and winning percentage, try limiting the amount of points that your opponent can score on you. Bad and average players tend to focus on making the longest word and scoring big points with those words. The advanced player focuses on restricting their opponents access to the high point value spots. One mistake in the game can determine the outcome. Over 75% of Words With Friends games are determined by the triple letter, triple word and spaces that connect those spots. Another tip that will help you achieve better results is to know all of the two-letter words that you can play across another word. The ability to play a small word off of the root of an already played word, can really pay dividends. An example would be to play the word ‘GO’ on the top of the root word ‘ROOM’. You get the point totals of the words ‘GROOM’ and ‘GO’. A nice bonus would be if the ‘G’ you place is on a colored tile for bonus points. Why is AB or OP accepted and IQ isn’t? You could argue that IQ stands for intelligence quota, which is an abbreviation. AB is name for the stomach muscle. Not sure about op….. I just started playing this very addictive game myself. Rambo is in the dictionary but it is not excepted. I don’t remember ever seeing Rambo in any dictionary. Wikipedia, maybe. Dictionary, no. Question, we have been getting updates on our Hanging with Friends game using our I-Pod touch from Apple. Is anyone experiencing updates from other websites. Today we got a message from “Match.Com” on meeting people and getting a free subscription. Anyone eslo experience the same stuff? Why does Hebrew not register as word? Jew is also not acceptable. Must be that WWF is refraining from using religious associations. Racial slurs are also not acceptable yet gay and Nazi and words as such are.